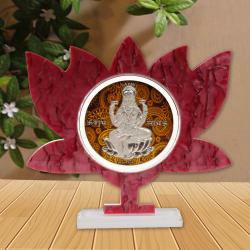 Product Consists : Acrylic Frame of Silver Plated Laxmi with Table Stand. 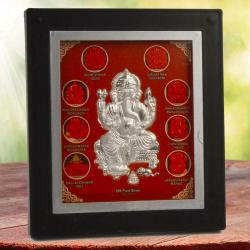 A beautiful Pure Silver plated Laxmi with Nice imported frame with stand. Gods figurine is made of pure silver foil and fitted very nicely in beautiful frame It has a self stand, so it can be stood up. It can be a beautiful show piece in your home. Having long lasting finish with superfine look. It can also be a unique and valuable gift to your loved ones. Bless up your home on this diwali with this traditional idol. 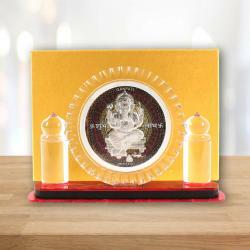 A perfect combination of color shade frame use makes this idol perfect for the puja ceremony. Goddess Laxmi the symbol of eternal power, wealth and wisdom. 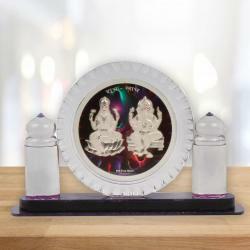 Product Includes : Acrylic Frame of Silver Plated Laxmi with Table Stand.